This chapter first provides evidence about identifying which patients with kidney disease might need palliative or supportive care. 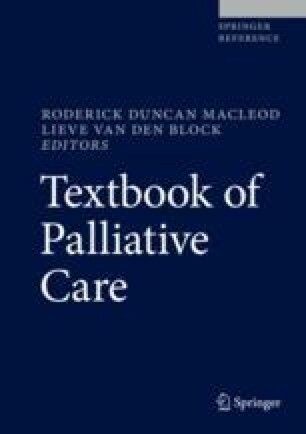 Although care should be based on needs and not on prognosis, it is nevertheless important to consider palliative needs in the context of the number of weeks, months, or years which remain. What needs to be addressed only weeks from death is often very different – and more urgent – than what needs to be addressed if there are years ahead. For this reason, there is a comprehensive overview of evidence on survival, so that the context of care can be understood. Then a more detailed examination of how to identify and manage common symptoms is included, although details of management may vary from country to country, according to local guidelines and availability of individual medicines. Pain, constipation, breathlessness, nausea, vomiting, itch, restless legs, and fatigue are all considered. The last days of life may sometimes prove challenging in terms of symptom management, yet it is important to provide best possible care at this time, so this stage of illness is considered in further detail. Finally, team working, communication, and planning ahead – all crucial for effective and coordinated care – are then explored, to help facilitate best palliative and supportive care for this population.